Best part of the day: Proud to finally announce the beta release of the ALL NEW Web UZZAP! Faster, looks even Better, Greater and much Smarter! Try it & contribute to the ongoing community reviews! OVER 1.4 MILLION ACTIVE users and growing! UZZAP is the first all – in – one messenger service for your mobile phone! It is also available to download on your PC or access it through the web application at http://uzzap.com/ , all you need is an internet connection. UZZAP uses your data or GPRS connection through your mobile phone to go online, it’s FREE for SMART subscribers, so you can stay connected 24/7! 2. Group Chat: enjoy chatting with your UZZAP buddies in private in your own room! 3. 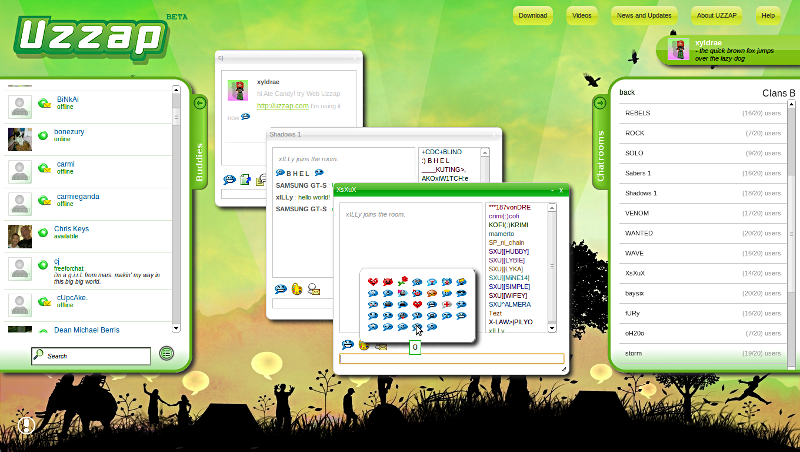 Instant Messaging (IM): connect to you YM or MSN or Chikka or Gtalk account and see all your buddies! 4. Post TWITTER TWEETS from any of your Uzzap applications! 5. Chatrooms: Enjoy chatting & meeting new people, grow your social network with over a 1000+ UZZAP chatrooms! 6. User Generated Chatrooms (UGC): Create your own chatroom! 7. Share Media: Send & receive picture messages from your phone or PC! 8. Invite Buddies: Increase your UZZAP buddy list by adding them through your phonebook, user-id, or mobile number! 9. AUTO Buddy Matching: UZZAP automatically adds your contacts on your phonebook who are already UZZAP users to your buddy list! 10. Themes: Enjoy various themes on your phones & personalize your UZZAP! TEXT UZZAP TO 7272 or go to http://uzzap.com/download NOW!!! Enjoy UZZAP’s Services & Discover More New Features to Come! This entry was posted on 10. August 2011 by Xyldrae. It was filed under Information Technology, Uzzap and was tagged with assured message delivery, chikka on mobile, community, extended messaging, facebook on mobile, group chat, gtalk on mobile, latest, meet new friends, offline settings, public chatrooms, tweet via Uzzap, twitter on mobile, unli chat, unlimited chat, user-generated chatrooms, Uzzap, web uzzap. bkit ung uzzap hndi po pwde sa samsung galaxy y.? device not supported. panu po mg dl ng uzzap sa nokia 5070 tnx po w8 ko po reply nio? wala na poh bang uzzap ngaun.